Poe’s tortured psyche is resurrected among the ruins of a fallen house where mysterious spirits bedevil the dead and it’s always a midnight dreary. Gothic designs, haunting music, and shadowy figures breathe life into Poe’s tapestry of terror, weaving his classics The Raven, The Tell-Tale Heart, The Bells, The Black Cat, and The Cask of Amontillado with his lesser known works, Berenice, The Oval Portrait, M.S. Found in a Bottle, and Lenore. Tales of Edgar Allan Poe is adapted by Bobby Box in collaboration with Jon Ludwig and directed by Michael Haverty. Puppeteers Luis Hernandez, Reay Kaplan, and Rudy Roushdi bring Poe’s infamous characters to life using a unique “table-top” puppetry style, in which live actors share the stage with the puppets on a multi-planed set. Music is performed live by Atlanta-based composer and percussionist, Klimchak, who uses unconventional and original instruments such as wine bottles, saws, and didgeridoos, to create a ghostly and tension-filled atmosphere. The show is recommended for ages 12 through adult and offers matinees and evening performances. Before the show, patrons may explore the Museum exhibits featuring beloved Jim Henson puppets such as Kermit the Frog, Cookie Monster, and Big Bird. During evening performances, a beer/wine cash bar is open before the show and during intermission. Valentine’s Day looking dreary? Bittersweet break-up? Is your love life “nevermore?” Or just looking for a different way to observe the holiday? 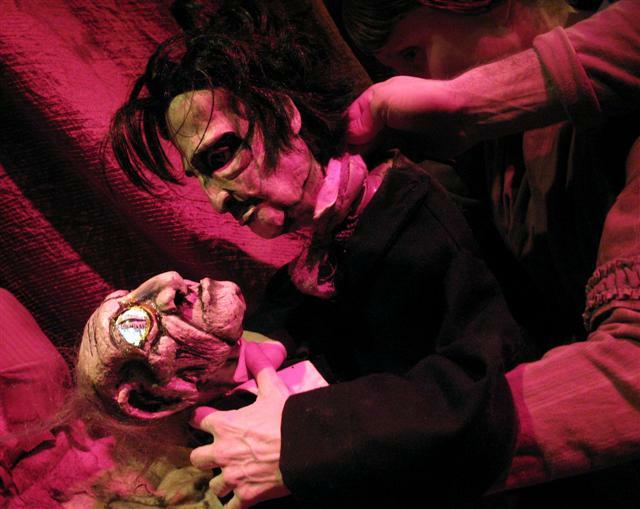 Come celebrate an unconventional Valentine’s Day at the Center for Puppetry Arts during our “Oh, Poe is Me!” Valentine’s Weekend, February 14th – 17th, 2013 (evening performances only). During this bitter-sweet weekend, guests may post “broken-heart valentines” for all to see, professing their various emotions for the significant others of their past, present, or future. Also have your “Poe-trait” taken in the style of everyone’s favorite tormented novelist. Whether you are in or out of love, this unique, tongue-in-cheek Valentine’s activity is sure to leave your heart yearning for more! Tales of Edgar Allan Poe runs February 12 – March 3 in the Center for Puppetry Arts’ Downstairs Theater. Performances are Tues – Fri @ 11:00am; Thurs – Sat @ 8pm; Sun @ 5pm. TICKETS ARE $15 (MEMBERS) AND $25 (NONMEMBERS) AND CAN BE PURCHASED ONLINE AT WWW.PUPPET.ORG OR BY CALLING THE TICKET SALES OFFICE AT 404-873-3391.